I recently ran a course in the Welsh lake district – the Elan Valley reservoirs, where there are many marvellous subjects to paint, including glorious river scenery. With this rather cold spring weather it was important to find locations where students could work out of doors in reasonable comfort, and as there are many sheltered spots in the Elan Valley area we were able to work quite happily. 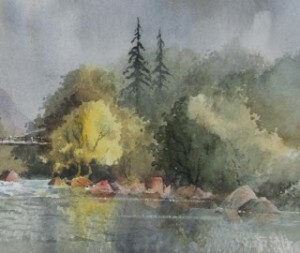 The picture shows a part of a watercolour of the River Elan which I did a few years ago on site. It’s a fairly rough watercolour, as I painted it while standing the middle of the river, using an easel. This was the optimum spot, and as it was painted to support the John Muir Trust, the Scottish-based charity that fights for the wild land of Britain, a photographer came along to record the event. Alas, after taking a few shots he fell into the river, but his camera was OK and all he got was a bit of a wetting. Although it was mid-summer, I haven’t used many greens in the painting, much of the foliage achieved with a deliberately dull blue-grey, created by mixing French ultramarine and yellow ochre, a rather opaque colour. This dullness helps to accentuate the bright yellow tree. With foliage, edges get lost easily, as they run into one another, and you can see how I’ve introduced light edges of foliage by painting the darker washes around the edge. It pays to look at the scene through half-closed eyes as this will eliminate much detail and allow you to pick out the more important aspects of the scene, both in terms of tone and detail. Please don’t try jumping into rivers to get your paintings done – not only can it be costly in lost equipment, but it can also be rather dangerous in the wrong place! This entry was posted in atmosphere, David Bellamy, Greens in watercolour, watercolor painting summer greens by David Bellamy. Bookmark the permalink. A great painting! The Elan Valley is a favourite place of mine. I struggle enpormously with greenery so it’s great to see how you do it so well.I certaintly won’t be jumping in any rivers to practise though don’t worry! Thank you David for more valuable tips. Which should be very helpful as I am off to Norway for a painting/walking trip soon.